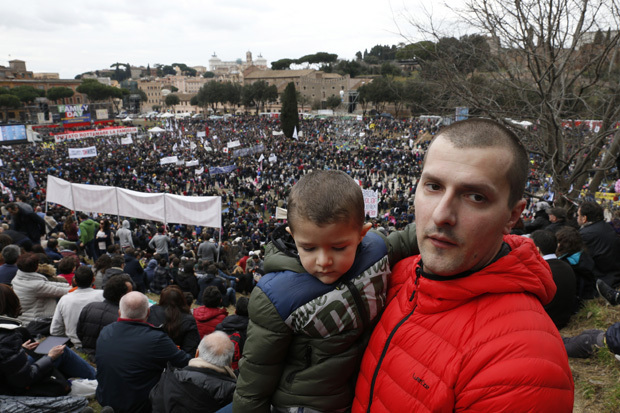 ROME (CNS) — Hundreds of thousands of people gathered in Rome’s Circus Maximus to protest against a proposed bill that would grant legal recognition to nonmarried heterosexual and homosexual couples and give them the right to adopt children. Although not officially sponsored by the Catholic Church or any other religious group, the rally Jan. 30 did include men and women religious and at least one Italian bishop. Most of the participants were families, many carrying signs defending the rights of children to be raised by both a mother and a father. The legislation, known in Italy as the “Cirinna” bill, includes a proposed clause that would allow for a nonbiological parent in a homosexual union to adopt a child conceived by his or her partner, either through artificial insemination or with a surrogate mother. The event’s organizer, Massimo Gandolfini, told the crowd that the rally’s aim was not “to make war against anyone” and that traditional families are the backbone of society. “The family cannot become a neglected institution; it is precisely the family that keeps our society standing,” he told the crowd. The “Family Day” rally, which is credited with leading to the defeat of a similar civil union bill in 2007, received endorsements from Catholic leaders and politicians in the country.